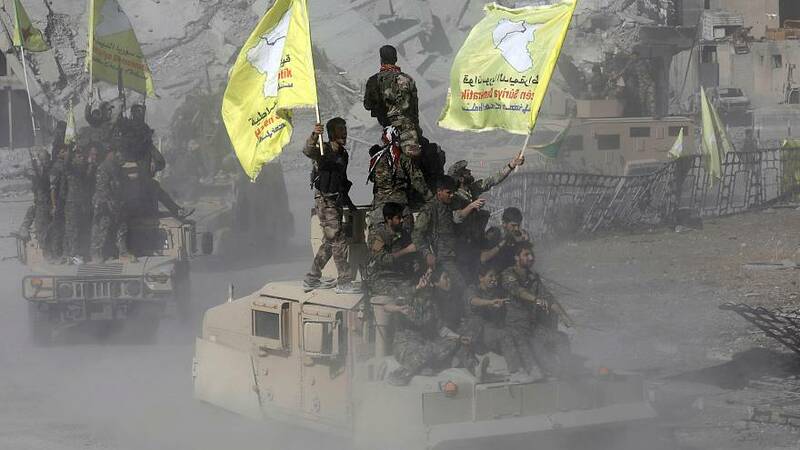 US-backed militias raised a flag inside Raqqa stadium on Tuesday, as a four-month battle to take Islamic State’s Syrian capital came to an end. The SDF, backed by a U.S.-led international alliance, has been fighting Islamic State inside Raqqa since June. A group of militia fighters and commanders clasped their arms round each other, smiling, in a battle-scarred landscape of rubble and ruined buildings at a public square. The flag in the stadium and others waved in the city streets bore the yellow background and red emblem of the Kurdish YPG, the strongest militia in the SDF. Islamic State has lost swathes of territory in Syria and Iraq this year, including its most prized possession, Mosul, and in Syria it has been forced back into a strip of the Euphrates valley and surrounding desert.